« Download ‘My Father, The Assassin’ E-book for less than Half Price! Now there is one thing I will say for the Italian Polizia, they take their work very seriously and no way will they let you get away with anything, because they will find you! More than three years ago, we were in Montecatini Terme and we stopped to ask a policeman for directions. He pointed to the turning we should take, and gave us precise directions to the address we wanted. We foolishly did as we were instructed. Then last week a letter arrived telling us that we had driven down and parked in a residents only street, had not paid our fine (which we never received) and with accrued interest we now had to pay 160 Euros or else! My man and I were disgusted and recalled the time when we were in Venice on the water ferry. At the last-minute, a Chinese couple jumped onto the ferry without tickets, and took the seats in front of us. They were actually from London and it was the last day of their Italian holiday. They tried to buy tickets from the ticket collector, but were angrily told to pay a 40 euro fine! It was obvious that they had made a mistake, however, they only had ten Euros Left. The collector called his colleague to witness his writing out a double fine for 80 Euros, which had to be paid that day at the local police station. And he said “If you do not pay this today we will find you, even in England or in China.” The poor things were terrified! Reluctantly, I decided to pay our fine, but only after I had visited the local police station and talked to a very unsympathetic officer there. It does not pay to get on the wrong side of these guys! 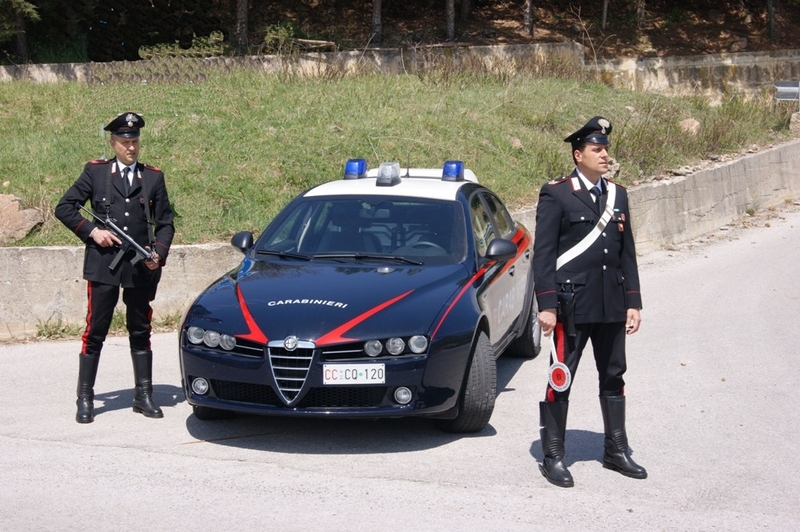 Don’t mess with the Carabinieri! Back in our local village of Fiano, there was a visit from the carabinieri, and some smashed glass is still lying around in the piazza waiting to be cleared up. We are trying to get the scuttlebutt on this, but everyone is strangely avoiding the subject. Sig Rotund arrived at the Laura’s cafe bar in the morning, with one arm of his glasses missing and promptly sent one of his ‘lady friends’ outside to our local Moroccan street seller, for a new pair of reading glasses. He then sat reading his paper with a paper price sticker over the lens, until I pointed it out. Fiano’s Piazza changes from a quiet village backwater to a night club atmosphere in the evenings, so this broken glass incident probably happened after dark. 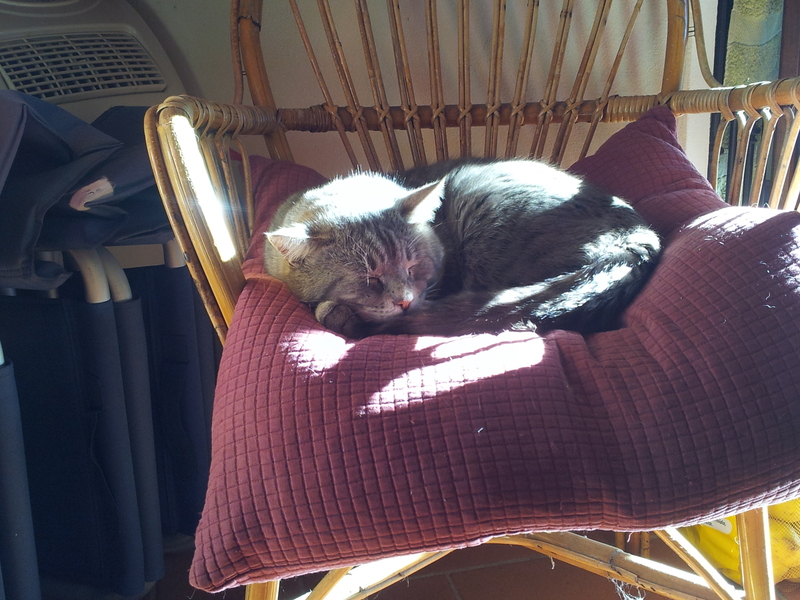 Farty Barty exhausted on his kitchen chair. And now for even more news. The ‘Poison Dwarf’, a local lady who is about four feet six and equally wide, actually smiled at me the other day, which knocked me sideways! She is usually very loudly putting the world to rights and glares at us a very time she passes….Then the national computer system at the Post Office broke down on Pension day and the oldie queue in Fiano went right down the main road…. Meanwhile, as the temperature was dropping, we had a delivery of gas and were informed that the price had gone down, yes down….while all this is going on, Farty Barty the cat calls in occasionally for food and a sleep, as he is too preoccupied with the girlies to be bothered with conversation…. And finally, the rain seems to have stopped. So some good, some bad news. But we don’t care about the bad news. Life eez good, Life eez now! Enough of that. I have mentioned before that I am not a creative cook, however, I do try to keep my man happy. A couple of days ago he said, “Lunch was really nice.” “Well, the way to a man’s heart is through his stomach, so the saying goes”, I replied. “Mmm, it’s also the way to his intestines…..” He responded. The moral to this is, if you are complimented on your cooking, just smile and say something like, “Well I’m glad you enjoyed it.” On the other hand, the last time I said that he replied, “That doesn’t mean I want to eat the same thing every day for the next two weeks!” You have to feel sorry for him though, living with an eccentric writer who is also a rubbish cook! Thank god for amore and good Italian restaurants! Finally, I’m sure you will be very excited to know that official invites are shortly going out for my Garden Rock Concert to be held on 28th June. 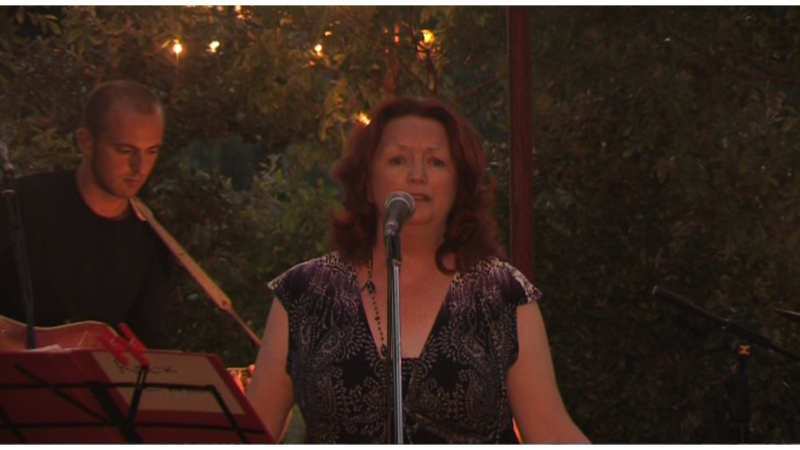 If you will be in Tuscany and would like an invite, send your email address to june.finnigan@virgin.net as I am very keen to attract more groupies! Well, I must crack on with ‘The Bolivian Connection’, which is getting very scary, and will update you on the gorgeous Silvio next weekend.